The General Data Protection Regulation (GDPR) is a new legislation that goes into effect on May 25, 2018 and will change how companies gather, store and use consumer data. Though it’s a European law, it affects any marketer that gathers data on a global basis. For example, if you or your clients have even one “data set” (that’s GDPR-speak for “contact”) who’s European, the GDPR rules apply to you for that individual—so keep reading. The GDPR is positioned to tip the data scales in favor of consumers for the first time in recent history, and it could significantly alter your marketing strategy in the process. If you’re one of the 94% of marketers who aren’t GDPR-ready, it’s time to listen up. Those who disregard this legislation could be hit with fines that would make your head spin—plus, it’s just not cool to be sneaky with other people’s data. We know you’re better than that. Below, we’ve provided a roundup of the best information, tools and tips for preparing your marketing strategy to become GDPR-compliant. But first, a disclaimer: This blog post is not a comprehensive guide to the GDPR legislation and should not be treated as legal advice or legal recommendation. If you have questions about the GDPR as it pertains to your specific circumstances, consult an attorney. What is the GDPR, Anyway? 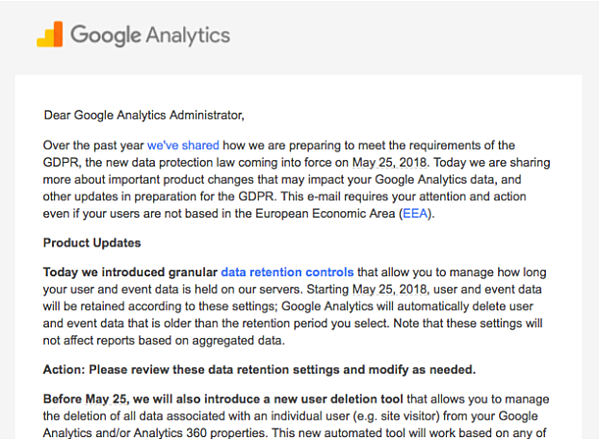 An email from Google Analytics to all users. Keep in mind, the GDPR was penned by lawyers and lawmakers—so don’t expect a light read if you intend to dive into the specifics of this regulation. But we’ve listed a few main pieces of the law below. In other words, how you got the consumer’s data in the first place. You can’t assume someone wants to be contacted, even if they fill out a form with their email address. The consumer must consent to be communicated with, which under the GDPR means “freely given, specific, informed and unambiguous” permission. What does this mean in practice? Well, it will be against the rules to use pre-checked boxes on forms, for one. Remember, consumers must intentionally opt in as opposed to opting out. 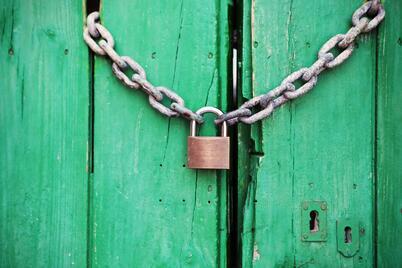 It may go without saying that any data marketers collect has to be protected—really protected. If your company stores “personally identifiable data,” including metadata like IP addresses and browser cookies to create profiles of consumers, consumers will now have new rights with regard to how you can use that data. And it’s up to companies to make this data easily accessible to the consumer, so they can see exactly what information is known. Furthermore, if a company has a data breach, the rules of reporting it will become stricter under the GDPR. In the future, a company must report a data breach to a supervisory authority within 72 hours of learning of the breach, or risk a hefty fine. The right to be forgotten is a newer concept under the GDPR, and gives consumers the power to request that outdated or inaccurate information about them be removed. In this case, neither the company that obtained the information in the first place, nor any third-party organizations, may access the information once it’s deleted. Also, just because someone opts out of your marketing communications then changes their mind doesn’t mean you can resurface old data about them. According to a recent HubSpot webinar, if a user unsubscribes—at which point you must remove or completely anonymize their data—and then resubscribes later on, they must be treated as a brand new contact. First, get budget and buy-in. It will take some manpower to get your marketing efforts up to the GDPR standards. By presenting a well-researched plan, get C-suite buy-in and the necessary budget to become compliant. Scrub your mailing lists. Remove anyone for whom you don’t have a record of their opt-in. If you’ve purchased mailing lists in the past (again, you’re better than that!) it’s time to forget those folks ever existed. From now on, it’s all about gaining consent. Double check your forms. Remember, no automatically-checked boxes! Get those forms GDPR-ready. Don’t forget about pop-ups, too—not just your gated landing pages. Get the sales team on board. And other departments, for that matter. Basically, if anyone in your company interacts with customers online, they should be well aware of the GDPR regulations. European Commission. Go straight to the source! HubSpot. They have everything from a product-readiness guide to a glossary of GDPR terms. Even if you aren’t a HubSpot user, the resources are valuable. Wired. Nitasha Tiku (@nitashatiku) covers general GDPR information and how some companies are preparing. Strategic. Fes Askari (@FesAskari_SIC) gives a solid run-down of the GDPR for digital marketers. Smart Insights. An overview, including proprietary data, plus many other related articles. SuperOffice. The “definitive guide” to GDPR and marketing, provided by Steven MacDonald (@StevenMacd0nald). ComputerWeekly.com. Chris Evans (@chrismevans) talks all things data storage in this article. Econsultancy. What is “privacy by design?” Ben Davis (@herrhuld) has answers. Mailjet. Specific to email marketing, learn the rules and recommendations to get ready for the GDPR. GDPR EU.org. What happens if you break the rules? Learn about the fines and repercussions. Digiday. Ross Benes (@RossBenes) provides a roundup of how some ad companies tried (and in some cases, failed) to become GDPR-compliant. DMA. A lengthy checklist to help your organization get up to speed. IT Governance. A solid checklist with additional helpful links. As marketers, we can’t let important changes like the GDPR regulations go unnoticed. Subscribe to the PR 20/20 blog to get other real-time marketing updates straight to your inbox! Elizabeth Juran is a consultant at PR 20/20. 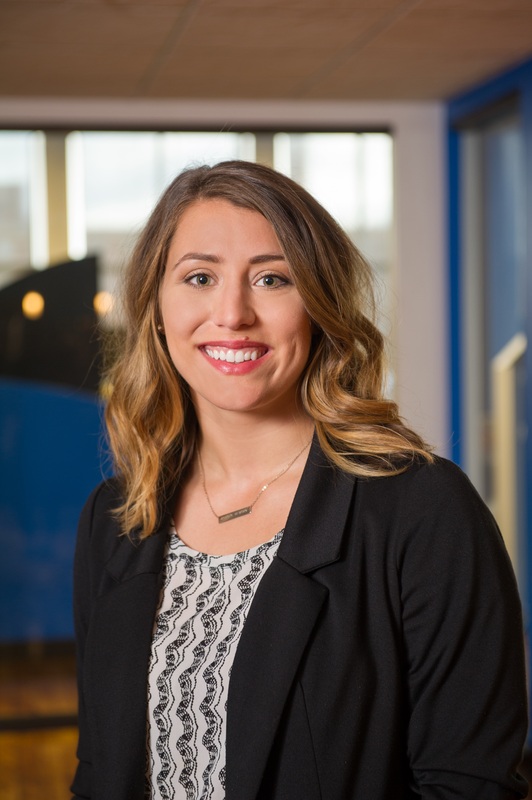 She joined the agency in March 2017 with a background in corporate marketing and communication.